We've gone into great detail about the importance of engagement surveys to provide the actionable insights needed to optimize the employee's journey. However, a successful employee feedback and engagement strategy can no longer be limited to engagement surveys alone. Pulse polls are a critical accompaniment to engagement surveys (and crowdsourced bottom-up employee feedback) that afford an employer a real-time perspective on various aspects of the employee experience. Also known as pulse surveys, they provide immediate, accurate, and frequent feedback to ensure a consistently insightful gauge on employee engagement and satisfaction at any given time. Working as a companion piece to these other components of an employee engagement strategy, pulse polls give HR and management the timely people data needed to identify trends within their workforce and make any necessary changes before the issues become systemic. What Is a Pulse Survey or Pulse Poll? No matter the terminology you prefer, pulse surveys are intentionally designed to be very brief, simple, straightforward, and easily digestible. While their engagement survey counterparts tend to be longer and more time-consuming due to long, open-ended responses, pulse polls are meant to be taken multiple times per month, preferably on a weekly basis. If designed and implemented properly, pulse surveys are extremely fast and don't require much of an employee's time, usually from 1 to 5 minutes. Typically speaking, the briefer the survey, the higher the participation rates. At their heart, pulse surveys are meant to increase employee engagement given the frequent feedback from employees that bolsters the notion of an organization that truly cares about the responses and wants the collective employee voice to be heard. This aspect of pulse surveys is particularly important to younger generations like Millennials and Generation Z. The true value of pulse surveys as a feedback tool lies with their ability to provide companies an instant measurement – or pulse – on particular issues or initiatives on a much more frequent basis than the traditional quarterly or annual surveys. The immediacy of pulse surveys is absolutely imperative for organizations to track progress – both in terms of production and operations – that could very well be gained or lost by the day. As important as corporate milestones and even setbacks are to the overall viability of an organization, they must be thoroughly understood and addressed far more frequently than those traditional models afford. Likewise, if an organization is implementing a new program or initiative, pulse surveys can immediately gauge the impact of such processes. When structural or leadership changes occur, pulse surveys provide the frequent, spontaneous people data needed to quantify the impact on the employee experience. Of course, as theoretically beneficial as pulse surveys can be, it wasn't until recent advancements in HR-centric technologies that leveraging their insights on a frequent basis became a realistic option, no longer creating an overwhelming addition to HR's already full plate. Specifically, the advent of online and cloud-based solutions has made it possible for companies to easily administer pulse polls at a far higher rate, therefore magnifying the immediacy of the data they provide. Furthermore, by integrating AI-based platforms and employee feedback solutions like Hyphen's, analyzing and extracting pulse poll results is now far quicker and streamlined, capable of isolating trends and providing actionable insight without delay. Mobile solutions only further enhance the process by providing a convenient way for employees to participate. That convenience and accessibility is vital in obtaining higher participation rates. By integrating a solution into common workplace communication tools like Slack, Yammer, or Workplace by Facebook – which are quickly becoming the face of modern business communication – solutions can seamlessly blend into the preferred internal communication platform within an organization, further increasing convenience and participation rates. One of the keys to developing an effective pulse survey is in the title itself – pulse. Keep your surveys brief, including no more than 10 questions in any particular poll. Although Hyphen suggests weekly pulse surveys, only conduct them that frequently if your organization is capable of analyzing the results and implementing any change in a timely fashion. Conducting surveys but doing nothing with the results will promote the idea that you’re simply going through the motions and don't actually care about the employee's voice. Like engagement surveys, pulse polls should be a combination of open-ended and closed-ended questions, using the Likert Scale to provide a range of possible answers – typically between five and seven choices – rather than a static, restraining yes/no format. A broader range of possible answers allows for a more nuanced, personalized set of responses. Although important, open-ended questions require more time to review and analyze, especially in larger companies. Make certain your organization can efficiently process the information using a machine learning platform capable of qualitative analysis. 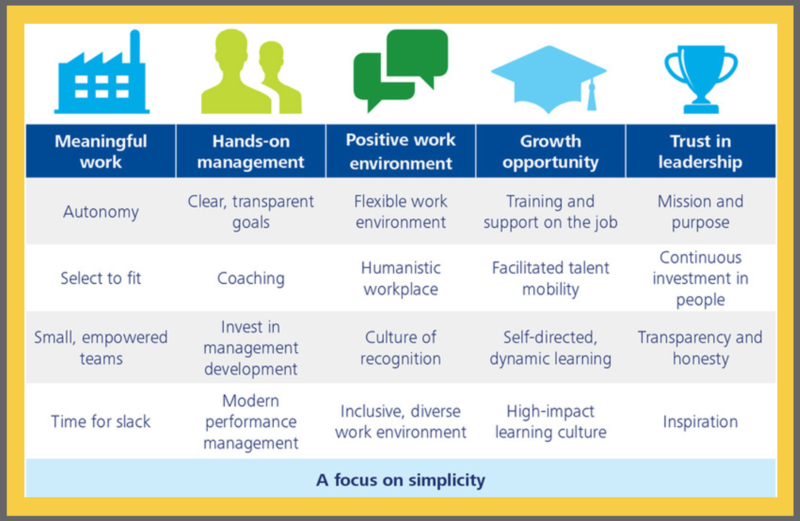 Meaningful Work: These questions will help employers better understand how employees view their autonomy, select to fit, and their downtime. Successful organizations are built upon a foundation of successful individual workers, a notion driven by intrinsic motivation the majority of the time. Hands-On Management: This category assesses how employees view the clarity and transparency of goals, the effectiveness of coaching, and investments in management development. Incredible Work Environment: These questions will evaluate individual recognition within the workplace, the flexibility and humanistic aspects of the environment, and the inclusiveness and diversity felt within the workplace. This category is absolutely essential in creating and maintaining a healthy, satisfying, and productive atmosphere. Trust in Leadership: Questions in this category monitor and interpret the sustained investments that employers place into their people, the level of inspiration felt throughout the workforce, how effective an organization’s mission and purpose are from an employee's perspective, as well as the transparency and honesty demonstrated by leadership. Culture of Performance: Understanding how employees view company performance – both now and in the future – is essential in gauging the amount of faith its workforce has in their organization's ability to succeed. Positive responses to these questions will display a high correlation to greater productivity levels since employees who truly believe in a company's success are far more likely to work at higher levels. Being armed with all of the useful information in the world will do you no good if you don't implement an effective plan. Pulse polls should be a primary component of your overall feedback strategy to work in conjunction with less frequent, more thorough engagement surveys. Likewise, an open-ended, crowdsourced employee feedback channel is imperative for employees to share ideas and feedback from the bottom-up on topics that aren't specifically determined by management. When collecting feedback from these various channels, initially concentrate on the most obvious, glaring results so you can immediately create a plan of action. Throughout the process, make certain to share feedback results and trends to management and leadership in a timely manner in order to transform the actionable insights into specific strategies as quickly as possible. In other words, always take advantage of the immediacy in people data provided by pulse surveys and polls to maximize your organization’s agility to expedite effective solutions.